Southampton made just one change to the team that started against Swansea, Romeu drafted in alongside Big Vic and Davis moved into the hole behind Pellè. Chelsea made several changes, the most significant being Terry returning as captain and a first league start for Falcao up-front. I was disappointed to see both Ramires and Willian starting as these Brazilians definitely give Chelsea more mobility in midfield. 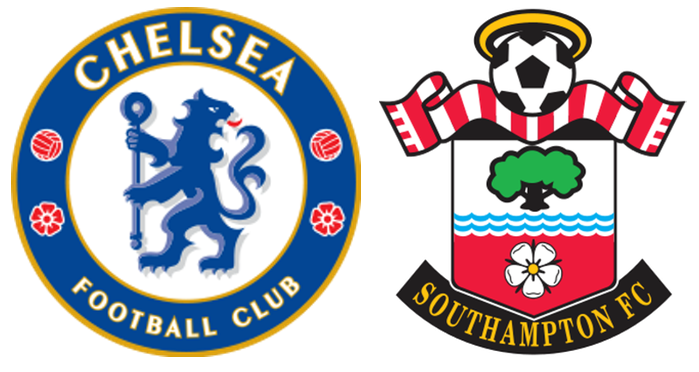 The game began with Chelsea pushing forward, but Saints looked comfortable. In the first serious encounter Van Dijk easily saw off Falcao. Saints first meaningful attacked was halted by the lino’s flag, Tadić blaming Pellè for not playing him in sooner. In the next few minutes, Saints won a succession of free-kicks and corners but delivery into the box failed to cause Chelsea serious problems. All too often the ball was clutched by Begovic or headed away by a defender. On 9' Romeu fouled Hazard and immediately the yellow card came out. Willian stood over the free-kick on the left hand side. He has been devastating in recent weeks so it was hardly surprising when he launched the ball up and over Stekelenburg. It rattled against the far post and nestled in the opposite corner. 1-0 Chelsea. Last season this early goal would have seen Chelsea lifted and seeking to bury their opponents - but it was Saints who redoubled their efforts. On 11' we won another corner from the left. Tadić’s floated cross was easily claimed by Begovic but replays showed that Van Dijk had been hauled to the ground by Ivanovic. The referee had managed to avoid seeing this clear foul in the box. He was starting to get on my nerves. Saints continued to press forward but Ramires was allowed to get away with a string of fouls to impede our progress. Big Vic was having another great game. With Romeu giving him the opportunity to get forward, for the second week running Vic’s barrelling runs down the left were effective and illustrated Saints’ early dominance. On a rare foray forward, Oscar was easily closed down by Cédric who is improving with each match he plays. On 16' Tadić set up Davis but his wayward shot sailed wide. Begovic was certainly the busier keeper and on 19m his poor clearance gave Mané the opportunity to chip him, but he got his angles wrong. Chelsea then enjoyed a brief period of pressure. Oscar fired over from long range but Saints’ centre-backs were looking unruffled and kept knocking the ball to safety. Van Dijk then made a mistake, giving the ball to Azpilicueta but Saints quickly regained possession. Chelsea were reduced to long range pot shots; Stekelenburg fielded comfortably from Hazard. Down the other end Mané was thwarted by Terry before Chelsea engineered their best move to date. Intricate play down the left saw Fabregas feed Oscar and this time his shot was on target, but Maarten was well placed to save. On 26' Bertie was booked for kicking Willian. It seemed that Chelsea were getting away with plenty and Saints fans clearly agreed. I’m sure they chanted “Have you bought the referee?”. Their demeanour was not improved on 32' when Ramires tripped Mané in the box. The referee put his whistle to his mouth – but failed to blow it. A minute later he compounded his folly by booking Mané for diving when fouled by Ivanovic. Azpilicueta then dived, under pressure from Cédric, and – of course – Chelsea got the free-kick. Play fair FFS! Saints fans’ ironic cheers were obvious on 38m when Cahill’s foul on Pellè resulted in a free kick to us. Chelsea were penned into their box following the free-kick but neither corner did any damage. Another sweeping Saints move on 40m saw Bertie run onto Mane’s great pass but Begovic was able to thwart him. The keeper then claimed Davis’ corner. On 43m another Ramires foul finally saw yellow. The free kick was rolled to Fonte who lofted the ball into the box. Pellè got in front of Cahill, pinned him and chested the ball to the onrushing Davis. Time stood still. Davis then met it on the edge of the box and, for once, fired a crisp volley past the dive of Begovic. 1-1 – and Northern Ireland’s captain was off celebrating. It was no more than Saints deserved. They were dominating possession and much of the game was being played in Chelsea’s final third. They continued to push on, but in added time Big Vic upended Oscar allowing Willian another free kick in a dangerous position. This was more central so Saints created a strong wall which blocked the Brazilian’s shot. Half time: 1-1. Both sides made half time changes. Ramires and Romeu, both on yellows, were replaced by Matic and JWP respectively. I like Romeu but once he is carded he begins to look like an unfortunate accident waiting to happen. I was glad to see JWP enter the fray as his free-kicks and corners are less likely to end up in the keeper’s gloves. Big Vic now sat deeper but Saints were going forward again. Cahill made an important intervention to stop our progress. On 48 minutes Saints cut their hosts apart; first Mané, then Tadić made monkeys of Chelsea’s defenders. Begovic made a great stop from Mané before JWP fired wide. Saints should be ahead by now. Both sides then enjoyed periods of possession. Saints centre-backs found themselves marooned upfield when Chelsea broke, but the impressive Cédric tidied up. Van Dijk seemed to win most of the crosses but on 54m one clearance dropped to Oscar giving him a chance to cross again. His overhit pass sailed harmlessly beyond everyone. On 56' Van Dijk carried the ball into the Chelsea half and looked like he was going to take a pot at goal. Sadly he passed to Mané instead. Chelsea then fed the ball into Falcao but his dying-swan dive over Stekelenburg fooled no-one: apart from a few Chelsea oafs – and Mourinho, apparently. Falcao was yellow carded. Bertie was enjoying himself raiding down the left. On 58' Pellè tried to put him in on goal but fouled a defender. On 60' poor control by Cahill presented the ball to Tadic. Pellè took the ball off him and pushed the ball to Mané who turned Terry and slotted the ball past the onrushing Begovic. 1-2 and it had been coming. On 64' Pedro replaced Willian. I breathed a sigh of relief. Falcao should then have walked after an awful foul on Mané. I’ve seen straight reds given for less, but this official felt it did not merit a yellow. Shocking! On 67' Tadic was fouled by Ivanovic, giving JWP a shooting opportunity. His first effort rebounded off the wall and his second sailed over the bar. On 70' Saints seemed to be defending too deep, but at least they kept recovering the ball. Saints then surged upfield. A quite lovely move ended with Tadić running the ball out of play. On 72' another Chelsea move broke down and Mané carried the ball into their half at pace. Panicking Chelsea defenders back-pedalled, as Tadić and Pellè gave Mané options. He selected the latter and rolled the ball to the right hand edge of the box. The big Italian looked up to get his bearings, then struck the sweetest of shots past Begovic and in off the far post. 1-3 Saints. Mané continued to look dangerous. He was so fired up I feared he may earn another yellow card, but with the ball at his feet he was imperious. On 76' he closed down Cahill, robbed him then ran round the big defender holding him off with sheer brute strength. He set up Tadić whose goal-bound effort was well blocked by Terry. Chelsea broke upfield from the corner but Oscar’s effort was scooped wide. JWP was yellow carded for a tug on Oscar and Rodriguez replaced Tadić on 78'. In the final 10 minutes Chelsea tried to gain a foothold but a long shot from Fabregas sailed into the crowd. Even when Stekelenburg dropped a cross at Hazard’s feet, Saints were able to clear. Another Chelsea shot went wide. A dangerous charge by Pedro was stopped by Fonte and from the resulting corner, Pellè headed away. The big striker was then yellow carded for a trip on Hazard. With Willian off the park it was Falcao who shot at goal but Bertie headed over. Stekelenburg punched the corner away. I don’t have much time for Niall Quinn as a pundit, but on 85 minutes he was heard to describe Saints as “absolutely excellent”, showing he is a better judge than I gave him credit for. The last 5 minutes saw Saints continue to protect their lead and we were rewarded with 5 minutes added time. After 2 of these Mané came off for Yoshida. Saints continued to press hard and, with the ground emptying we were treated to a chorus of “Are you watching Pompey scum?” from the travelling fans. Time was up and Saints got the result their performance deserved. I was amazed by Jose Mourinho’s post-match rant. Had the referee not bent over backwards to help Chelsea, Saints would have won by a bigger margin. I have spent enough time in mental health units to recognise someone losing touch with reality and, sadly, the Chelsea manager appears to be doing just that. Things are starting to look rosier for the Southampton. Without the distraction of Thursday night football, we have every chance of progressing in the league and both domestic cups. Go Saints! The last match I reported on was our 2-0 win over Burnley last season. That day I made Steven Davis my MoM and he was one of several strong candidates again - nice to see him score at long last. However, this time I’ll stick with convention and give my vote to Sky Bet’s choice – Sadio Mané. Well played sir – you absolutely beasted the Chelsea defenders all afternoon.